I parted ways with my Danish friends as they went off to Bolivia and I went to Puno. The adventure to get to Puno was something not short of pure adventure. I’ve only told a few folks about it but the memories from that day will live with me forever. Things got really hairy since I left Cuzco. Cuzco, a beautiful city in looks, was manipulative and dirty in rip offs otherwise. Beggars and aggressive crap sellers lined the streets. And loads of untrustworthy tourist companies. You won’t be able to tell who is good, you just ask around. We sort of did that, but I went with a company because of their good English and kindness to answer all my questions without showing any annoyance like other places. My fault. I bought a bag from the same folks that holds a name of a very very good brand, only to find the bag was a fake and it began falling apart within 24 hours. They were responsible for some other things and it was like I was on a bad luck curse after leaving Cuzco… bad luck translated into getting ripped off money wise but always working out. Anyway, thanks to my adventure getting to Puno I befriended to Italian girls and we met for dinner somewhere in Puno that was close to both of us. I had to get the hostel worker to walk me half way because he insisted I take a cab for the four block trip to the restaurant because I was alone. I was mad. Normally I wouldn’t care, I dare someone to try to hold me up, but after the day I had I was in no mood to face robbery also so I convinced him to walk me through the danger area. I had walked home without a problem alone though. One of the Italian girls, Claudia, was on the same tour as me so I got to see her again the next day. 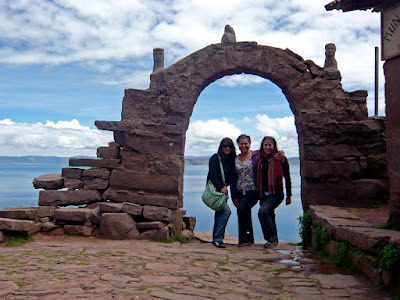 Our tour, which I wished there had been another way to go about this, was to see the islands of Lake Titicaca. That tour was the most stupid thing I had paid money for. The first island was the floating reed islands, which I had been excited for until I saw how touristy they turned the whole thing into. There were more gringos than natives, they were going in the native’s homes for pictures and the natives all had shops set up selling things that were really expensive. I wanted out of there so bad. The next island was Amantani where we were to stay the night with host families. Normally a cool thing to do, however, these folks host so much they are probably bored with it and do it solely for the money. I paired up with Claudia and we were assigned two Canadians. At first I was a bit annoyed because I was originally told I was going to stay alone with a host family, which is what I wanted, and now I was with three other people when all the other groups were in pairs: couples. It turned out to be cool though, the Canadians were really awesome and Claudia who speaks five languages translated conversations with the host family for us. 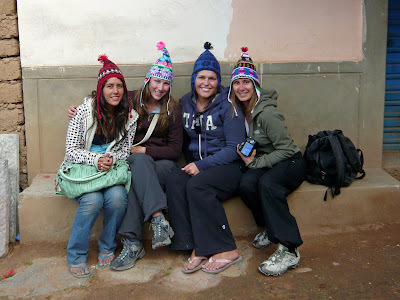 We all met at the school on the island, about 70 gringos all wearing native hats, which is part of the tourist thing. We’re lent them to feel like we’re at home there, but we just look like a bunch of idiots. I took it for what it was, not real and I wasn’t going to see what real life was on this trip. We walked up the trail up the gradual mountain, the trail built by stones that reminded me of Ireland, and the trails were all lined with tables of crap for us tourists. I saw Snickers and Twix for the first time in South America there, on an island on Lake Titicaca… Sour Skittles too. We got to the top where there was supposedly a coffee shop. It wasn’t a shop but walls without a roof and a stove that was making hot chocolate and the most amazing Andean doughnuts! I bought 8 or so of them… we were all in love. And we ate, watched the sun go down, and a beautiful storm in the distance which eventually made it our way but much later giving us the night to walk around without getting wet. We walked back to our homes and the host family women (in our case because we were all women) came with traditional dress and dressed us all up for a party. It was fun! Two skirts, a baggy top and a very tight belt that made it hard to breath. There was a shawl as well, and I think it took a special something to keep it on your head without bobby pins. We walked to the school again and we were joined by other gringos all dressed up too. The boys get ponchos and a hat. The gringos again out numbered the natives. The band was made up of were all boys about high school age. We danced, I loved it. The simple couple dance isn’t that interesting but every now and then we would all hold hands and spin in circles around the room, running at times (very hard when you can barely breath from the tight belt). I loved the music. They had a big drum with the fur of the animal still on the skin, a number of pan flutes, a ukulele, and two guitars that looked like they had been through hell. There were about 6 or 7 boys in the band and they took some incredibly long breaks. I didn’t want to leave because I loved the music so much, but I left when the other girls did. The next day we got on a boat to Taquile, not to be confused with Tequila. This is the island people say is their least favorite, however, I decided to break away from my tour group and stay another night there. We walked through town, we ate at a restaurant that was to be the place where I was going to stay the night, and I walked them to the boat down billions of stairs. These islands aren’t flat, they are a like humps in the water, you’re always walking up or down something. This particular island had a tall hump (the peak of the island called Molusina is 4074 meters from the top)The level of altitude between the port and the town varies from 3.810 to 3.950 meters above the sea level)at the top was something… I didn’t know what, but I decided to find out. There are trails everywhere. These islands have no cars, they use donkeys to transport things. They have loads of sheep everywhere and every woman cares a spool and thread with her and spins the sheep wool as they go about things outside of their homes. They harvest mostly potatoes, eleven varieties on the island (over 400 types in all of Peru) and other things. The paths lead everywhere so I had to make sure I remembered how to get back to my home for the night. I was alone, I didn’t know how to really ask how to get back if I did get lost, and they may not be able to answer since they speak Quechua and not Spanish. That walk was one of the most amazing experiences I’ve ever had in my life. That island was so incredibly beautiful and green, it was like the life style had stopped in time. There are terraces on the islands, and all throughout Peru that were built by the Incas and were kept in use throughout time. There were sheep everywhere, and these black bees and were so loud as they buzzed by you. I’ve never seen a bee like this. They would stop by you and hover there, float by you long enough to take close of picture of them (If I had a good camera those would be awesome pictures). When I made it to the top I was greeted with ruins of something. It was a place to worship Pachamama which is like the earth God. I met a guy later who would offer the first sip of his drink to the floor, or Pachamama in his mind, as a thanks for saving his life once. The shrine to Pachamama also had a cross there. It was a place of walls without a roof again. I sat inside one of the rooms and read my travel book and wrote in my journal and contemplated my life. I was up there for hours and only saw a few other people. There were other crazy gringos who had decided to stay but they were with other folks. I was the only one alone. It made me kind of proud since I know that many people would hate having to do all these things alone. It would have been nice to share these amazing experiences with someone, but it was just as amazing that I did it alone. I found the place alone, and I found my way back alone. Before heading back, to beat the sunset since I didn’t want to navigate the trails with my headlamp, I watched the storms in the distance again. It’s rainy season, but luckily the rain waits till well after nightfall to come to these islands. Back at the restaurant where I was staying I sat in my room and stared out my many windows. It was very scenic. I loved being here, but I was alone so to pass time I played solitaire before going to the kitchen to find my host mom where I was invited to come cook with them. I greeted the mother of the family in their kitchen around seven, it was pitch black by this time and the storm had rolled in. The mother was sitting on a log next to a stove fed by wood with two open holes at the top that you put the pots over. She made soup with potatoes and vegetables, and on very top a whole fish… eyes, fins, and all. I wasn’t sure how to eat it since I just had a spoon, and the father took his and showed me… well, he may have been joking, but he literally ate the face off his fish. I decided to pick mine apart with my fingers. The family had three kids, a 16 year old daughter, an 11 year old son, and a small little girl. They knew some Spanish, the father was the most active conversationalist, but I still didn’t talk much with them. They seemed to have a lot to say to each other, only in Quechua. It was interesting to observe though. We all went to bed after dinner, I was unsure of when to get up for breakfast, but it didn’t matter, I woke with the sun and waited till I saw activity. I made my way to the dock to catch my boat home with the intentions of catching the first of two I was told would be coming round (with another tour). The first one wasn’t there, I asked every boat that came. No one knew where my boat company was. I waited for three hours before giving the boat master a hard time in Spanish. He said my tour boat was a crappy one and no one knew where it was, it may not show. Super. Then as I’m telling this woman whose little kid wanted to play with me about my disastrous trip so far (in Spanish) and was overheard by some guy who offered for me to come on board his private boat with his group of students. They were all from WI! Yay! I was saved and had a great conversation with the tour guide they had. I left the next day for Arequipa, my last stop.